However, individual events did cause high losses for those concerned, for example crop losses in the agricultural sector as a result of drought in Europe. Also, it is the second half of the year that usually brings higher losses. For example, in 2017 the series of major hurricanes, Harvey, Irma and Maria, pushed overall losses for the year to US$ 340bn. The overall losses of US$ 33bn were roughly half those of the previous year and of the price-adjusted average for the last 30 years. 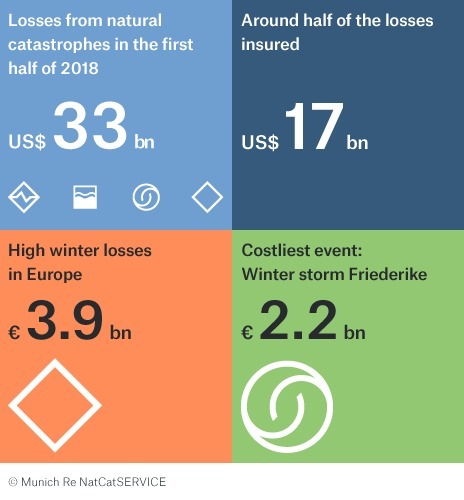 At approximately US$ 17bn, insured losses were less than in the previous year (US$ 25.5bn), but matched the average for the first six months over the last 30 years.